The chickpea or chick pea is also known as gram, or Bengal gram, garbanzo or garbanzo bean, and sometimes known as Egyptian pea. Its seeds are high in protein. It is one of the earliest cultivated legumes: 7,500-year-old remains have been found in the Middle East. Chickpeas have been associated with a number of possible health benefits for medical conditions. Chickpeas have a delicious nutlike taste and buttery texture. They provide a concentrated source of protein that can be enjoyed year-round. They are a noted ingredient in many Middle Eastern and Indian dishes such as hummus, falafels and curries. These beans are cream-colored or sometimes whitish in color, fairly uniform and rounded in shape. 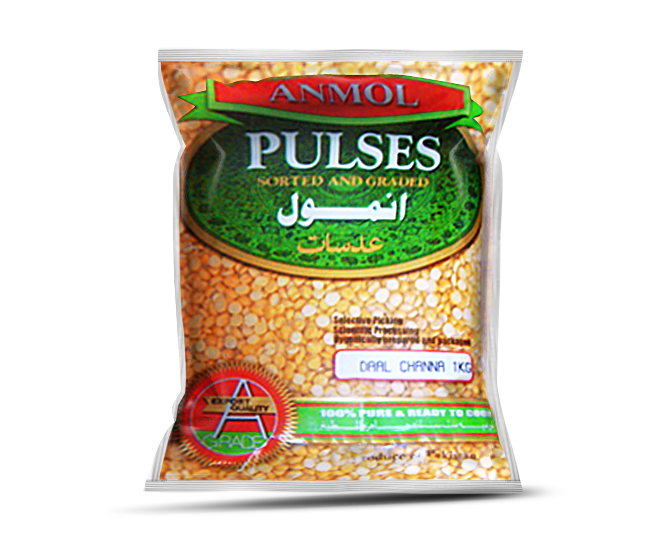 Anmol provides their customers with the best quality Pulses. 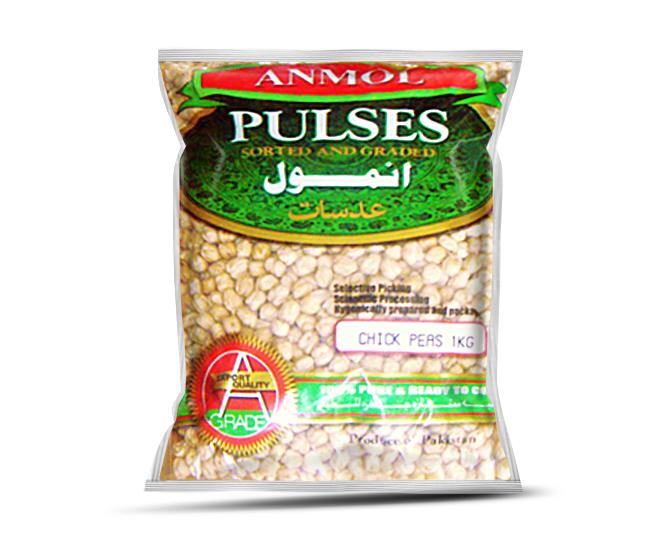 Our Pulses are available everywhere for the convenience of our customers. Kala channa is a variety of chickpeas. Although chickpeas are a variety of chickpeas but they have a very different taste for the white channa. Kala channa are used to make various cuisines and one of the most popular vegetarian dishes in Pakistan, India, Bangladesh and UK. These are basically legumes belonging to the Fabaceae family. The plants are short in height and are mostly found in tropical and subtropical regions. The ‘desi’ variety comprises of darker smaller seeds having a rough outer covering. 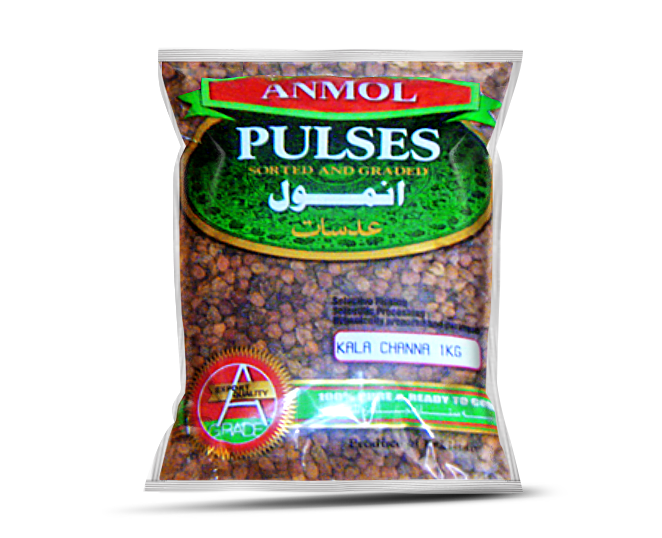 Black chickpeas, also known as Bengal grams, or ‘kala chana’ belong to the ‘desi’ variety and have a much higher fiber content and lower glycemic index. In addition to their delicious nut like taste and buttery texture, black chickpeas are extremely beneficial for health. Channa Daal is an agricultural or culinary preparation consisting of the dried, peeled and split seeds of Pisum sativum, the pea. The peas are round when harvested, with an outer skin. The peas are dried and the dull-coloured outer skin of the pea removed, then split in half by hand or by machine at the natural split. Split peas are high in protein and low in fat. The split pea is known to be a natural food source that contains some of the highest amounts of dietary fiber. Channa Daal it is referred to generically as dal and is the most popular dal in India, Pakistan and Bangladesh. 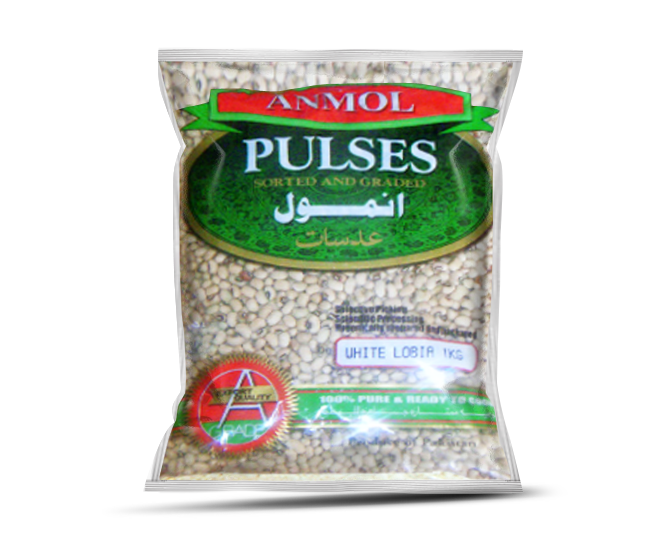 Mash bean is commonly known as the white lentil and is grown in the southern asia. 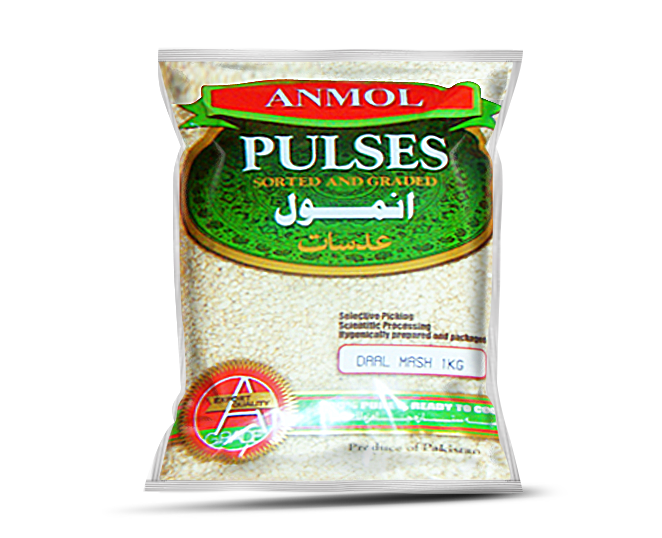 It is largely used to make saal from the whole or split, dehusked seeds. Black gram is very nutritious as it contains high levels of protein, potassium, calcium, iron, niacin, Thiamine and riboflavin. 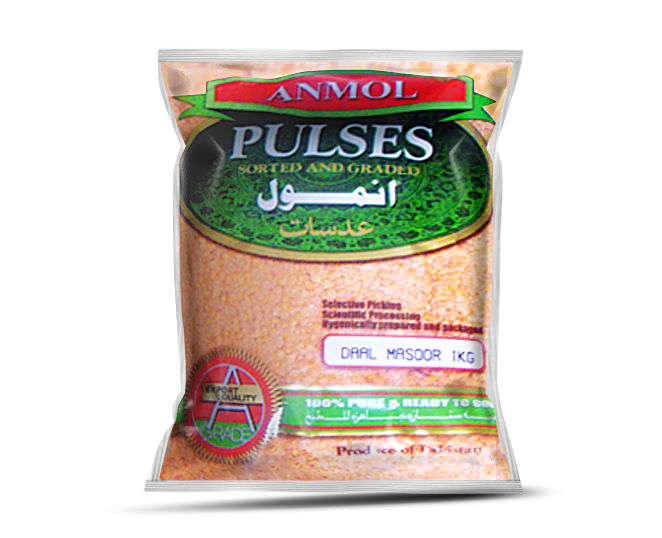 Mash Daal complements the essential amino acids provided in most cereals and plays an important role in the diets of the people of Nepal and India. Mash Daal has been shown to be useful in mitigating elevated cholesterol levels. Red lentils are one of the most common types of lentil, and the best known among the red lentils is the Red Chief. It’s a lovely salmon pink in its dried form, but it turns golden when cooked. These lentils cook faster than others. They’re best in purées or soups. It is regularly eaten with rice and vegetables in southern India. It provides proteins for a balanced diet. Masoor Daal is mainly used in vegetarian cooking in multiple areas throughout the world. 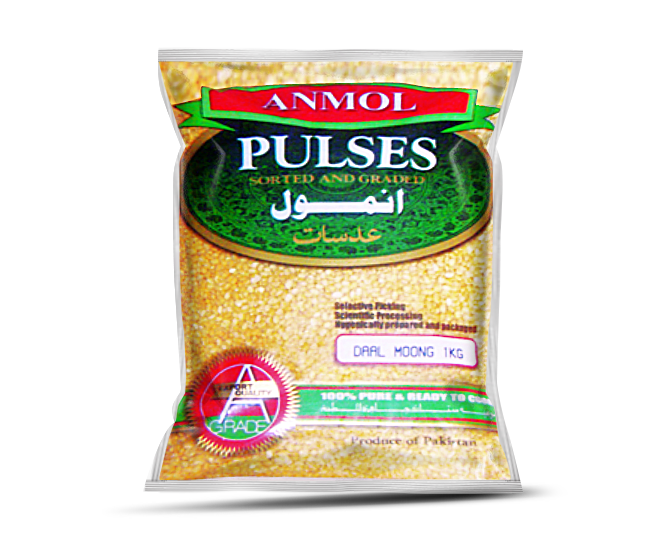 The spilt bean is known as moong dal which is green with the husk and yellow when dehusked. These beans are small oval in and green in color. They mostly grown in India Pakistan and Bangladesh. It is the seed of Vigna Radiata. The mung bean is mainly cultivated in India, China, and Southeast Asia. It is used as an ingredient in both savory and sweet dishes. About 3500 years ago mung beans were widely cultivated throughout India. Cultivated mung beans later spread from India to China and Southeast Asia. The kidney bean is a variety of the common bean. It is named for its visual resemblance in shape and color to a kidney. Although the kidney bean is not of Indian origin, it is a part of regular diet in Northern India. 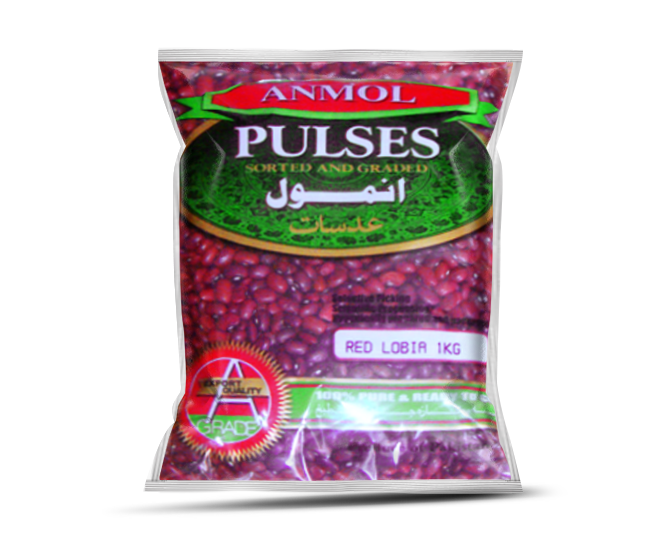 The dish developed after the red kidney bean was brought to India from Mexico.Red Lobia was first domesticated in the Himalayas it was later cultivated in China and Korea before 1000 BC it was later taken to japan it is now the second most popular legume after soybean. Kidney beans are a very good source of cholesterol-lowering fiber, as are most other beans. In addition to lowering cholesterol, kidney beans’ high fiber content prevents blood sugar levels from rising too rapidly after a meal, making these beans an especially good choice for individuals with diabetes. White kidney beans so named due to their convex shape that resembles the kidney — are among the best foods for helping you lose weight due to their high fiber content, which leaves you feeling full for longer and keeps food cravings at bay. Native to Central and South America, they are well known for their texture and their ability to absorb flavors. Rich in fiber, white kidney beans also contain essential nutrients such as minerals, vitamins and proteins.